Hunan Jiada wire cable limited company is located in Changde City, Dingcheng District Industrial Zone, founded in 1998, the company registered capital of 24000000 yuan, the total assets of over 100 million yuan, covers an area of 50000 square meters, construction area of 30000 square meters, the company with advanced technology and modern production and testing equipment, the production of low smoke zero halogen power cables, overhead insulated cables, control cables, PVC insulated wires and cables, special cables such as the six major categories, more than 1000 kinds of specifications. Wire and cable industry in the front rank of enterprises. Since its inception, the implementation of innovative business strategy, people management strategy, technology strategy of forerunner of three old strategies. Have a major talents, major technology, major equipment, major service, with integrity and scientific quality management system, implementation of strict scientific management, technology and products to meet the same industry leading position. As in the same industry in the top, the rapid development of the electric wire and cable manufacturer, best of cable in the " forge ahead in unity, innovation and dedication, beyond the self, the pursuit of excellence " spirit of enterprise, to the "good faith, innovation and development" business philosophy, from the enterprise construction plan at the beginning of, keeping up with the international advanced technology industries, a high starting point, high standard of planning production facilities, technology and equipment, detection means, thus never lay and maintain the leading position in the industry. Establish a perfect after sale service system, the maximum to meet customer requirements, so that the company's production of rated voltage 450/750V and below PVC insulated wire and cable, control cables, overhead insulated cables, and including 35KV 1KV and 3KV power cables with extruded insulation product lasts, stability to meet the corresponding GB/T5023-2008, JB8734-1998, GB/T9330-2008, GB/T12527-2008, GB/T14049-2008, GB/T12726-2008 national standards, product by the national, provincial, city quality and technical supervision departments repeatedly supervisory sampling inspection. The enterprise is the quality of the generation, the development of the road, is the eternal theme of enterprises. In order to improve the quality management level, to prove that the company has the ability to provide stability to meet customer and applicable statutory and regulatory requirements of the product. Company in accordance with the " eight principles of quality management ", by employing a systematic and transparent approach for quality management, for all parties needs, establish, implement and maintain the continuous improvement of the performance of the quality management system, enterprises have passed ISO9001 quality system certification, ISO14001 environmental management system certification and occupation health safety management system certification, products are a national industrial products production license, the national compulsory CCC certification. Xiang Jia " brand products by the majority of users of the trust, the market coverage of Hunan, Hubei, Guangdong, Guangxi, Jiangxi, Guizhou, Sichuan, 20 many provinces, city. 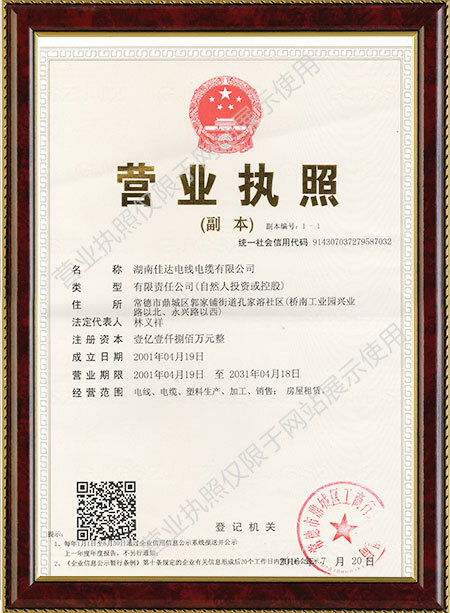 The enterprise and its products have won the " quality letter of the unit “ ” Hunan brand-name products, “ ” Hunan famous trademark “ ” good standardization enterprise AAA enterprise “ ” the contract and trustworthy unit " and other national, Provincial Department of honor. Good to get the honor as a starting point, as the driving force, to strengthen internal management, enterprise technology innovation ability to continuously improve product quality, better meet customer requirements, the enterprises to do the industry pacesetter.